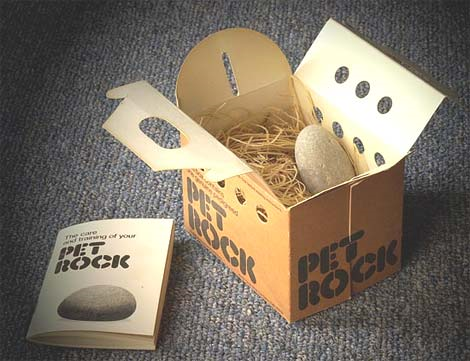 The Pet Rock was either a terrible toy or the most genius idea ever made. What a great pet! You do not have to walk it, feed it, clean it, take it to the vet, pick up its poop, or even look at it. And in return? Paint it, dress it up, do what you will and it will never complain, let alone bark, meow, grunt, or make any noise related to any living organism, ever. It will never run away, make any noise, or in any way remind you that it exists. And what do you get in return? Pure, pure love. What a great business that was. Rocks cost nothing to make and they are all over the place. Talk about your infinitely renewable resource. This was a huge fad back in the 70’s, but then again, so was Richard Nixon and Viet Nam. So what happened to all those rocks when the Pet Rock fad died? 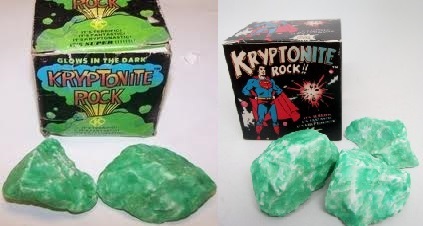 They were painted green and sold as Kryptonite. I have to guess that the only reason a kid would buy one of these was to lock it in a lead lined box so that Superman could never come in contact with it and lose all his powers. What’s next for the Pet Rock? CELEBRITY ENDORSEMENT! Coming Soon: Mr. Blog’s Tepid Rock! Just in time for Christmas! Sadly that was all too real. Think of it as a low tech Tamaguchi.